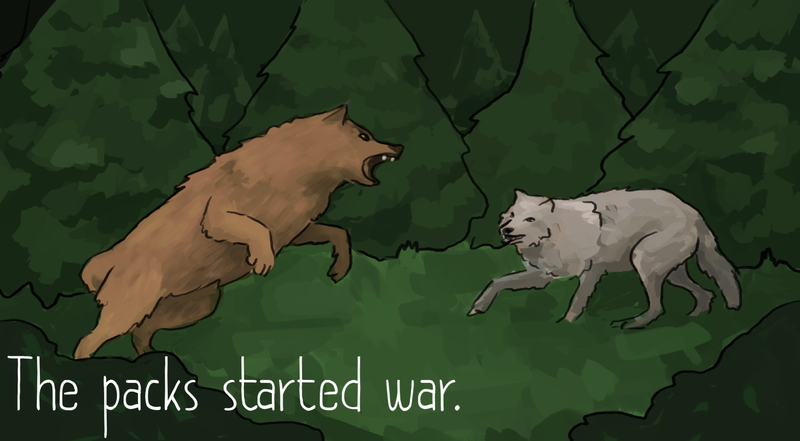 The safety of the forest is lost when the rivalry between two wolf packs escalates. The other animals must pick a side or face losing their home. 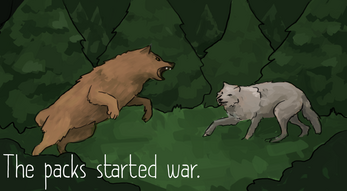 You are thrown into the centre of this conflict as a fox saves a grey cub being attacked by the brown pack. Unable to fend for himself, you must cross the forest and guide the cub back to his mother. In Wild Heart, battles take place on a hex-based grid which is built into the environment. 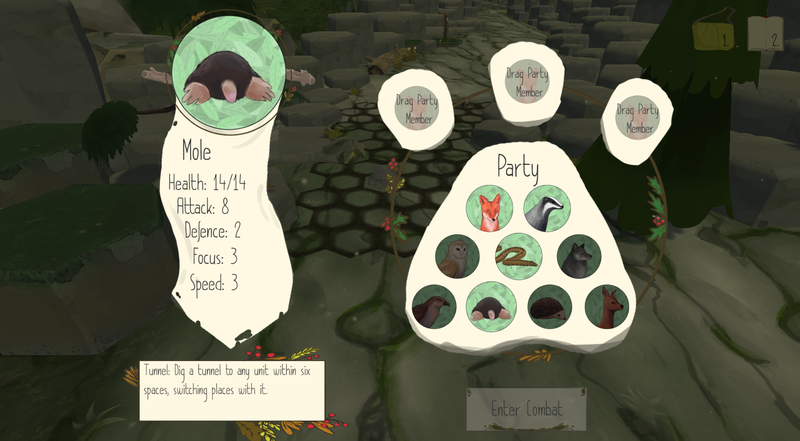 Use mole holes to quickly transport your animals around the arena, set up ambushes in long grass, and eat strange mushrooms to boost your animals' abilities. Rescue animals, befriend them, and add them to your team. Each one is unique with its own special ability. 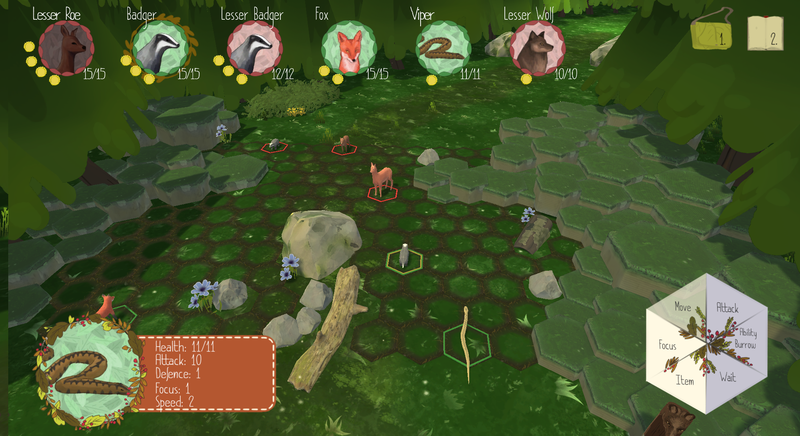 The hawk can swoop across multiple hexes, attacking anything it passes, while the badger can dig a defensive sett into the field. Combining and experimenting with these abilities is key to victory. You’ll need every bit of help you can get to journey through the forest. Scavenging rare barriers can get you out of a sticky situation, and other animals caught in the conflict may be willing to offer you their aid. There are even rumours of a resistant badger posse who have been nothing but trouble to the wolves. We're a small development team still at university, and Wild Heart was our project last year. We'd love to hear your thoughts on it. Get in contact at tworavensgaming@gmail.com. A new Mac Version and fixed a few issues with the Windows version. Fixed the "level 5 error"
Reverted to an older build. Uploaded a new build to fix sound and graphics issues. I had a lot of fun with this game! I loved the hex-based fighting style, and the writing was the perfect mix of cheesy and serious! However, I did have some issues getting the game to save as sometimes when I pressed "e" the save menu wouldn't come up which I thought was odd. I did post a gameplay video for it on my small channel and if you got the chance to check it out I'd be very appreciative. Thank you for creating such a fun game! I don't get it. 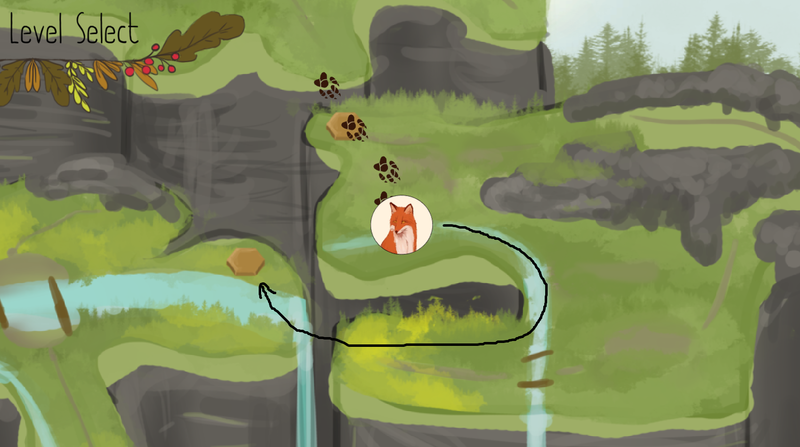 After the text came up and passed the screen just said Select Level with a circled pic of a fox. But there was nothing to click on. I don't know what I'm supposed to do other than just delete the game. So i did. I did a first impression (german only) as well. Loved the game, played it in one sitting! I played this on stream earlier tonight. Had a good time, but I had some huge menu problems. At first, the game would stick on the level select screen. Later on, I couldn't load or start a new game (settings/exit from the main menu still worked). Did you check if the volume was up in the settings? Or was just no sound playing at all? Sorry about that, we can look at making this clearer! 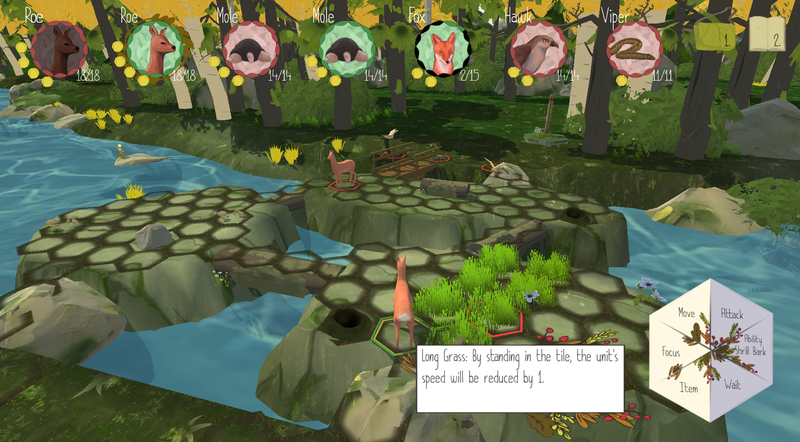 If you take this path around you'll be able to reach the third level. Aww, I love this so much! RPGs are my favourite type of game, and although I'm not usually keen on the tactics style having forest creatures as the main characters won me over! 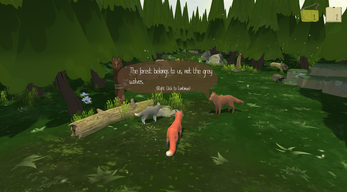 The story is nice and engaging (darn that too cool for school badger crew!) and really reminds me of an old kid's show / comic called The Animals of Farthing Wood? If you've never heard of it look it up, it's eerily similar to some of the traits in this game (in a good way haha!). So I went ahead and played level 2, but everything seems to have gone wonky! The save system stopped working, and the battles weren't activating and then when I tried to go back out of the game and back in to play level 3 I couldn't even load up my game or start a new game. I redownloaded the game and still couldn't get anywhere, so I'm thinking my computer may have done something dumb... but I will try to get the game up and running again so I can play level 3 because even though level 2 didn't work properly for me I still really enjoyed it haha! Thanks for playing it xD. There should have been sound. Which version were you on and was the whole game silent? the art style is amazing!!! i nearly cried i cry at everything i play but yknow and i'll probably play it a thousand more times. i wish it lasted a bit longer. the controls, graphics and music were really nice. i'm not an expert on games but that's just my opinion. i look forward to seeing more from you guys! I really enjoyed this game. Took me a bit od time to figure out how jeverything worked but when I figured it out I had allot of fun. I didn't run into any bugs, which doesn't normaly happen when playing indie games, so that's a plus. And I would definetly recommend this game to friends. I would love to try the game. Is there a chance for a Linux build? We're currently working on a mac version and looking into a linux one after that. It'll be a few days before we manage to get it ready though. Hi! Me and my sister just donated/downloaded the game but it seems there is a problem of some kind with the files, since we can't unzip it properly or install it through itch.io app. There seems to be an issue with 'level 5' file in the data folder (can't even unpack it). Help? We've taken a look at the game and managed to fix what was causing the "level 5" error. Try redownloading the new build and hopefully it should work! Thanks a lot for donating. We really appreciate it. Hi, I'm excited to play the game. I paid a few bucks for it, but I only have mac, so now it seems like I can't play it. Is there a mac version I can download? Hi, Tworavens, I do a small, weekly video game podcast, and we were wondering if you would be willing to be interviewed. 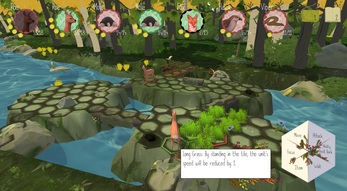 We are interested in your game and love the style and how imaginative it is. If you have any free time and would consider a short interview, please email me at superbscast@gmail.com. I would love to hear from you.